The Danish shipping giant Maersk has taken serious steps towards a more sustainable future in recent years. Last year, the company sold off its oil and gas business to French oil firm Total in a billion-kroner deal, and now it has announced that it has set a zero CO2 emissions target by 2050. That’s no small feat, considering the size and scope of Maersk and its operations, but the firm reveals it will usher in radical solutions over the next decade to steady the ship for a more sustainable future. “The only possible way to achieve the so-much-needed decarbonisation in our industry is by fully transforming to new carbon neutral fuels and supply chains,” said Søren Toft, the COO of Maersk. In order to reach the lofty 2050 ambition, Maersk plans to build emission-free ships by 2030 – which will require co-operation and input from the engine producers to the technology development suppliers. 2050 might seem like a lifetime away, but Maersk needs to get cracking now as there is little existing infrastructure to support CO2-free viability on the roads and high seas around the world. “The yet to come electric truck is expected to be able to carry max 2 TEU and is projected to run 800 km per charge. In comparison, a container vessel carrying thousands of TEU sailing from Panama to Rotterdam makes around 8,800 km. 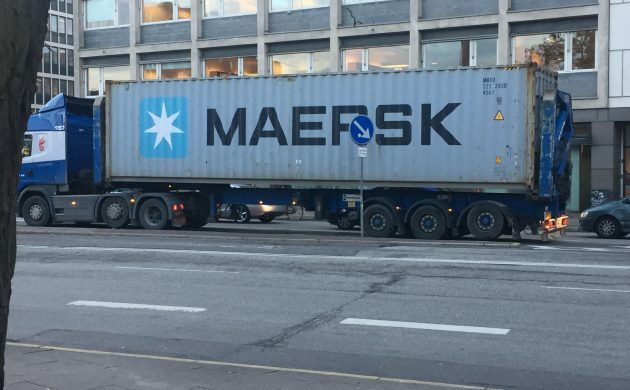 With short battery durability and no charging points along the route, innovative developments are imperative,” Maersk wrote.